Dr. Lyle Koca exudes passion and enthusiasm for his work, which becomes especially contagious upon entering Koca Chiropractic at 11420 Blondo Street. Celebrating 30 years of helping patients in 2019, Koca Chiropractic has been at this location since 2015 and is always expanding to help patients of all ages heal their bodies from the ground up. Dr. Koca grew up across the street from a chiropractor in Exeter, Nebraska. He had no idea what went on in the doctor’s office, but he got curious when cars began parking in the lot as early as 7:00 in the morning to line up outside the door. “People would get out and line up at the door like they were going to a rock concert,” Dr. Koca recalls. He couldn’t help but wonder what the doctor was doing in there. Later in high school, Dr. Koca threw out his lower back playing basketball, leading him to a series of strained encounters with his medical doctor. “He did what he was trained to do—gave me dope—and sent me on my way,” Dr. Koca remembers. “When the pain didn’t go away, he gave me stronger pills.” It was after his third round of heavy painkillers that 15-year-old Lyle Koca crawled his way across the street to the chiropractor’s office for help. On November 18, 1977, he said to the chiropractor, “I can’t take the pain anymore.” After two x-rays and an adjustment, Dr. Koca was back on his feet and planning for a career as a chiropractor. Koca Chiropractic is open six days a week. Dr. Koca and his staff are ready and willing to enhance the quality of your life using their cutting-edge technology and the Gonstead System, which provides specific system analysis and a precise way of adjusting for optimum results. If you want an office that treats you like family, call Koca Chiropractic today at 402-496-4570 or visit kocachiropractic.com. Between crashing thunderstorms, tornado sirens, and celebratory fireworks, summer can wreak havoc on an anxious dog. Symptoms of pet anxiety can include trembling, tucking the tail, hiding, diarrhea, barking, urinating, howling, chewing, disinterest, and escape behaviors such as digging and scratching at exit points. Agitated animals may also lick and nip at themselves (leading to skin sores) or get injured while trying to flee. Fear is an instinct that manifests in all animals—humans included—and can be caused by everyday stressors. When an animal perceives a threat (real or imagined), the “freeze, fight, or flight” response is triggered. If an animal is already suffering from separation anxiety (which includes about 14 percent of dogs across America), perceived threats can develop into phobias, which are fears based on a specific stimulus. Thunderstorms and fireworks are the two most common phobias for pets. Typically, phobias develop in the formative age, between one and three years. On occasion, separation anxiety can form between 8 and 10 months, or as a symptom of aging. Whether your pet is suffering from separation anxiety or a specific phobia, finding the trigger is essential to helping alleviate the symptoms. The best way to help prevent anxious behaviors is to modify them using training techniques meant to relax your canine companion. When an animal is exhibiting signs of anxiety, do not encourage the behavior in any way—your pet may interpret this as a reward. Instead, encourage your pet to be calm without reinforcing the fear. During a storm, for example, resume normal activities within the home and participate in an activity that your dog enjoys, like playing ball or cuddling on the couch. Some dogs feel safe when crated, but some do not. Keeping your dog out in the open can sometimes alleviate feelings of being “trapped.” Never punish an animal that is panicking or exhibiting anxious behaviors. When treated early, counter-conditioning can be a slow yet effective way of treating pet anxiety. If your pet has separation anxiety, for example, exposing your pet to small amounts of alone time and growing from there can lead to a vast improvement in behavior. When treating a dog with separation anxiety, the goal is to teach the dog to tolerate being alone without its owners. Your pet may even grow to enjoy it! As for thunderstorms and other trigger events, be sure that your dog has a “safe” place to hide. This might be a favorite closet, a bathroom, or the basement. Giving your pet free rein to find its “happy place” if it wants to hide can significantly help reduce fear and anxious behaviors. Some dogs, however, benefit from being outside, in the thick of the noise itself, playing ball or being distracted by an activity. If you try this, be sure to stay outside with your dog. If anxious behaviors develop, allow your pet to come indoors. Turning on the radio or television for background noise indoors can help drown out loud sounds and, potentially, keep your canine calm. Finally, if these tactics don’t help, there are pet body wraps specifically designed to make pets feel safe in triggering situations. The idea is the same as swaddling an infant—that the gentle but constant pressure of the wrap feels like a safe hug. 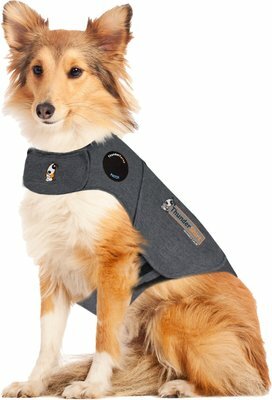 ThunderShirt is a popular brand, but you could even use something like an elastic bandage to wrap your dog. If your dog’s behavior is still out of control and you prefer the natural route, a relaxing massage or substances like Rescue Remedy or pheromone sprays might be the answer to your pet’s woes. Rescue Remedy is a combination of herbs and flower extracts meant to calm the nerves. Pheromones come in a diffuser and emulate the hormone that mother dogs produce to increase the bond with her puppies. While both are deemed safe and natural, it is always important to consult your veterinarian before beginning any sort of treatment plan. Your vet will want to rule out any possible medical conditions (for example, thyroid or brain disease) that could be causing the seemingly anxious behavior before starting a treatment plan. Sometimes, lead poisoning and other outside contaminants can cause this type of behavior, as well, so your veterinarian will perform a blood test before administering or prescribing any medication. Medication is typically a last resort and only used in severe cases, particularly during occasions like thunderstorms or fireworks displays. Medicating your dog may make you a bit uncomfortable, but, just like with people, it is sometimes the most effective way to help a pet get through a severe episode of anxiety. If your pet is prescribed any anti-anxiety medication, be sure to follow your vet’s instructions closely. *On May 15, I had the privilege of being a stringer for the Associated Press. Here is my account of the evening, as published in the Omaha Press Club Newsletter. May 15, 2018. 7:55pm. It is a beautiful evening in Omaha, five minutes before polls close, and the Douglas County Election Commission is abuzz with excitement. Chairs are being dismantled and replaced with counting tables, and at the stroke of 8:00, a volunteer cheers “Hear ye, the polls are closed!” As a first-time stringer for the Associated Press, it was an exciting yet intimidating experience for me to say the least. 8:30 pm – After recording the initial tallies, I call into the Associated Press to report tallies. Voter turnout has been low according to volunteers, and while some races show little to no competition, others come within hundreds and sometimes tens of votes. Thank goodness for the help of dedicated volunteers as well as Pack 5, a troop of Boy Scouts dedicated to running the ballots from cars into the Douglas County Election Commission for counting. At 8:45, the next set of results are expected in. 8:45 pm – A slight lull descends upon the volunteers until the next carts filled with ballots rolls in. Boy Scouts continue to boost morale, skipping and running with ballots safely tucked in their arms. They, unlike the haggard volunteers who have been working since 7:00am, are tireless in their energy and high spirits. 9:30 pm – Almost every race I have been assigned to follow has been decided, with the exception of the Democratic Congressional contest between Brad Ashford and Kara Eastman. At this hour, Eastman leads Ashford by a mere 11 votes it appears to be anyone’s race. 10:00 pm – Most volunteers have gone home. Those that remain work feverishly to organize voter registration forms and booklets. They collate every single one into numerical order to ensure each has been accounted for. 11:40 pm – All that remain at the election headquarters are the bare bones of its staff, the Election Commissioner himself – and this solitary Associated Press Stringer in the lobby awaiting final results. 11:55 pm – After a long but educational evening of tallying and phoning, I conclude my final call with the Associated Press and head home, followed by the remaining skeleton crew of Election Commission staff. What would you do if an armed gunman came into your school or place of business? At Lion’s Gate Security, owners Joseph Hodges Jr. and Calvin Jones are determined to help people prepare for the worst. Serving 20 years together in the gang unit of the Omaha Police Department, Hodges and Jones were often partners. Eventually, Hodges joined the military as a nuclear missiles technician, completing two tours of duty in the Middle East. In 2007, towards the end of Hodges’ military career, both he and Jones retired on the same exact day and during a two-year hiatus, they decided to bring their longstanding idea of starting a security company to life. After attending several networking events through the Greater Omaha Chamber of Commerce, Lion’s Gate Security was up and running. Now the Chamber has repaid the favor, and has chosen Lion’s Gate Security as their May Small Business of the Month. Comprised of over 100 employees, Lion’s Gate Security primarily hires former law enforcement, firefighters, and EMTs to fill out their diverse force. However, Hodges and Jones pride themselves in also hiring those with little to no experience, because they tend to stay on and learn everything in security from A-Z. With a group of trained EMTs headed by former fire captain Marvin Ervin, Lion’s Gate provides emergency services during Storm Chasers games as well as at performances at the Orpheum and the Holland Center. They are all equipped with CPR and AED training. It is their shooter preparedness program, however, that is beginning to take notice in the community. As Hodges puts it, “we just think security and safety should go together.” By marrying their two sets of experiences, Hodges and Jones have been able to implement cutting-edge techniques to keep companies, schools, and churches safe. Since they themselves were 911, they know that officers hope to get to an active shooting in five minutes, but victims need a plan of action other than simply calling 911 to keep themselves safe. Julie Sanford, an 11-year veteran of the Sarpy County Sheriff’s Department, is now conducting seminars for the public on active shooter preparedness. “You hear in the news about when an active shooter comes into a business, and you hear people saying, ‘we should have seen the signs.’ Well, the problem with that is … there are all these ‘dots.’ The key in active shooter prevention is what’s called the threat assessment team, who teach moms and dads what to look for and how to connect the dots,” she said. Another thing to keep in mind is that these “random” acts of violence are not typically as random as one might think, as research is beginning to show. Active shooters tend to be disgruntled employees, jilted lover or mentally ill individuals with some sort of “reason” behind their actions. While Lion’s Gate Security works primarily for private institutions, Sanford insists that, “We would love to educate everyone.” Whether it is a business, church, school or any other public place, security and safety education is something that anyone can benefit from. The company can also provide physical uniformed security for events, access control, alarms, cameras, as well as CPR and AED training. “Whenever somebody moves, always be aware and cognizant of who they are and what they are doing,” Hodges warned. Having this consistent awareness for their surroundings is what truly sets this security team apart from the pack. Lion’s Gate Security is truly a “one stop shop for all of your security needs,” Sanford said. The company can do anything from providing and installing security cameras to doing all of an organization’s emergency preparedness training. Offering threat assessments and security surveys, the team at Lion’s Gate can give a corporation a clear picture of whether a business is prepared for the worst. They even have lipstick tasers and cellphone stun guns for sale, to help people feel reassured as they go about their everyday routine. Visit http://www.lionsgatesecurityservices.com for more information. Building his business on a foundation of expertise in his niche, Jason Gilbreath at Reclaimed Enterprises creates an environment in which customers are free to let their creativity take the wheel with reclaimed and salvaged wood. “We want customers to feel welcome, to feel comfortable explaining what it is they are looking for, and to feel like they are talking to people that have expertise and actually care about the product,” Jason explains. Working at First National Bank for 10 years, Jason was the head of wealth management and wore several hats during his time with the company. While serving on the board at the Boys and Girls Club, he saw the blighted housing of the city and wanted to do something to refurbish the area. Eventually, this led to the beginning of his business four years ago and the launch of Reclaimed Enterprises. Now the Greater Omaha Chamber of Commerce has chosen Reclaimed Enterprises as their April Small Business of the Month. Jason appreciates the help of the Chamber for their assistance in growing their network within the immediate community. “They offer a lot of programs that are there to help businesses grow and give them access to expertise. They featured us in one of the “We Don’t Coast” publications. I think the Chamber has done quite a bit to help us,” remembers Jason. From wall treatments to doors, flooring, furniture, mantles and more, reclaimed wood can turn into something entirely new, as demonstrated in the showroom at Reclaimed Enterprises. Even the flooring there is made from reclaimed shipping container flooring, as is Jason’s own desk. Sourcing materials from all over the Midwest, including Nebraska, Iowa, Colorado, Wyoming, Minnesota and South Dakota, Jason works with a variety of woods including black walnut, sugar maple, hickory, chestnut, oak and ash. In Omaha, according to Jason, 90 percent of the buildings they source wood from contain Douglas fir or pine. Depending on several variables, understanding each piece of wood is essential when deciding which material to use for any given project. Two-time customers Greg and Nancy Rexwinkel were extremely satisfied with the level of expertise Jason and his team demonstrated in replicating the same mantle from two differently sourced wooden beams. “We needed a replica and it looks perfect,” says Nancy. The most interesting aspect to Jason’s job is the amount of local history his firm possesses in one warehouse. Currently, it contains 44 beams from one of the oldest buildings in South Dakota, and over 40 massive round timbers that were once structural supports for a Union Pacific Building. One project of note was referred to Jason by Project Advocates when Creighton was planning the removal of the Joseph J. Vinardi Center 1915 gym floor. The University has an on-campus green initiative, and once the deconstruction was completed, Reclaimed Enterprises was engaged to design and build new products from the flooring, including everything from commemorative bottle openers to butcher blocks, coffee tables and bar tops with ample square footage to spare. With a focus on craftsmanship, Jason must sometimes allow the material to dictate what it will be used for as a finished product. Once a material has been selected for a project, Jason and his team of experts ensure every piece of wood is in the right condition for the project. The team also must remove any old nails, clean, brush and cut the wood to the proper size, and re-mill it for each client’s needs. However, they do everything they can to preserve the integrity and original beauty of each piece of reclaimed wood. By seeing the difference between the raw material and a finished product, he said it is surprising what can be accomplished with a reclaimed wood and the expertise of an experienced staff. If you are at all curious about adding a reclaimed wood product to your space or selling lumber on consignment, contact Reclaimed Enterprises, located in the North Downtown Makerhood at 1445 North 11th Street. Their products can also be found at Millard Lumber Showroom and http://www.reclaimedenterprises.com.